Until recently, I’ve been inclined to agree with Mr. Obama. The culture wars are over. We lost. We’re no longer fighting to uphold traditional social values. Now we’re fighting a battle over the very definition of what it means to be an American, and what America means to the world. But it turns out the president himself has reignited the culture wars he so smugly declared were passe. Like most leftists, Mr. Obama assumed his values and opinions had become the norm (think, “The science is settled” and other pronouncements of opinion as fact). 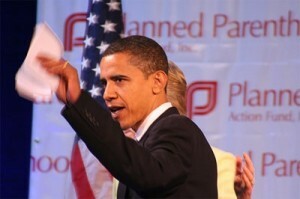 When, two weeks ago, he arrogantly announced the Health and Human Services directive requiring all employers (or their insurers) to provide free contraception, sterilization and abortifacient drugs as mandatory provisions of health care coverage, Mr. Obama must have quite naturally assumed his edict would go unchallenged. Despite warnings from Catholics in his midst (even Vice President Joseph R. Biden), Mr. Obama was convinced he could impose his version of morality on the entire nation, irrespective of the religious objections of the Church. The response from the faith community is rocking the administration back on its heels. Aside from the righteous indignation of the Catholic bishops, more than 2,500 evangelical and Protestant leaders are responding with vehement objections to this assault on religious freedom. This week, they signed a letter denouncing the president’s mandate not as a “Catholic issue” or a “contraception issue,” but as one of religious liberty. Yet that’s not the fight that suits this president’s re-election bid. No one wants to be the “Anti-religious Liberty President,” after all. Better to rekindle the culture wars and cast himself as the guy who facilitates the sexual and reproductive “rights” of all Americans. After all, we’re told more than 90 percent of all women use or have used contraception, including Catholic women. To heck with what the Catholic Church actually believes about this subject – there’s polling evidence that it’s popular. Conveniently, the Obama White House only cites polling data when such data validates its arguments. For example, a plurality of Americans consistently has said in poll after poll that they don’t want Obamacare in the first place. “We don’t govern by polls,” the administration declares. Except when it does. And never mind that pesky First Amendment. Meanwhile, back in the Constitution, an experiment fails. The fact that leftists declared the culture wars a thing of the past – so arcane as to be labeled ” ‘90s” – meant concerns about the declining moral and ethical underpinnings of our nation were summarily dismissed as uncool, unhip, unimportant. But nothing is more important. During the past two weeks, thanks to the misguided tenor of the debate about the HHS mandate, people actually are talking and writing about the impact of the sexual revolution on our national ethos. To be sure, the issue is religious liberty. Whether or not the culture wars are reprosecuted, the rights of conscience and the free exercise of religion according to the tenets of one’s faith are paramount to our existence as a nation. But by all means, bring on the culture wars – because in case you haven’t noticed, the culture we have is crumbling, and it’s not a reflection of our politics, but the very thing that’s causing our era of discontent.